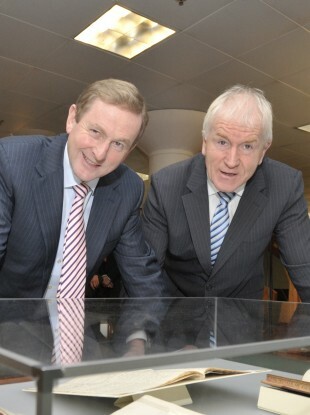 The Taoiseach identified a particular difficulty in demoting Arts Minister Jimmy Deenihan yesterday. ENDA KENNY HAS said it was particularly difficult to inform Jimmy Deenihan he was being stripped of his Cabinet ministry yesterday as he compared the reshuffle to selecting a team for an All Ireland Final. The Taoiseach was speaking in the aftermath of yesterday’s reshuffle of ministerial portfolios which saw five ministers in total dropped from Cabinet including Deenihan, a TD for Kerry North-West and Limerick and former All Ireland winner with Kerry. The Taoiseach informed Deenihan that he would be moving out of the Arts portfolio, and was essentially being demoted from Cabinet as he takes up a new role as Minister of State for the Diaspora. Speaking outside Government Buildings last night, Kenny said: “These are difficult days when you have to talk to people you know so well to say: ‘I am either changing your responsibility or you’re not having responsibility from now on’. That’s always difficult. “It’s a bit like selecting a team for an All Ireland Final from a panel. People are always disappointed. I had to sit this morning with Jimmy Deenihan, you know, a very good friend of mine for years, and make the decision that we’re going to change responsibilities here. Kenny said he was “glad” that he had identified what he called a “particular niche” for Deenihan who will work with the Irish abroad through both the Department of the Taoiseach and the Department of Foreign Affairs. The Taoiseach also indicated that Deenihan will examine whether Irish emigrants should be allowed vote in presidential elections. Kenny said that with 20 months left of the government’s term he has told the Cabinet that he intends to go to the last day of the coalition’s remit and “then let the nation have its say”. Email “Enda on reshuffles: It's like selecting a team for an All Ireland Final, people are always disappointed ”. Feedback on “Enda on reshuffles: It's like selecting a team for an All Ireland Final, people are always disappointed ”.